This spring, The New School, led by Parsons The New School for Design and the Milano School of International Affairs, Management and Urban Policy, is partnering with the Skid Row Housing Trust in Los Angeles, a nonprofit organization that develops, manages and operates homes for the homeless. 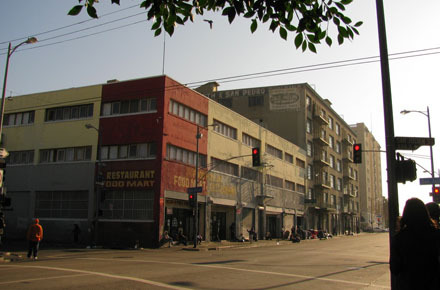 Students will be applying their knowledge of finance and design to tackle the complicated housing crisis for the homeless in the Skid Row neighborhood. The New School has a long track record of partnering with community non-profit organizations in underserved neighborhoods from New York to New Orleans and Washington, D.C. Students from the Milano School bring to the table an expertise in financial analysis and cultural competency, while students from Parsons bring design thinking to urgent social issues. Together, these collaborative teams work with neighborhood partners to enrich urban communities. Through this project, students will tap into the creative voices and engagement of the community at all levels to conceive new places to live, learn and rebuild lives within strong communities. The resulting proposals will incorporate fine art and design interventions that respond specifically to the lives of local residents, from oral history projects to murals and other projects that speak to home and neighborhood. This collaborative initiative was recently named a finalist for a grant from ArtPlace, a collaboration of nine of the nation’s top foundations, eight federal agencies including the National Endowment for the Arts, and six of the nation’s largest banks. ArtPlace supports creative placemaking with grants and loans, research and advocacy.